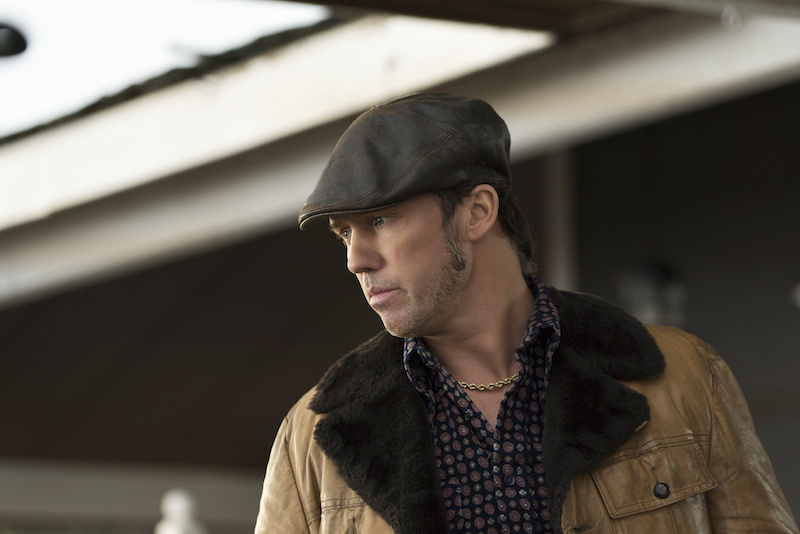 After a week away from Peggy, Ed and Dodd (Jeffrey Donovan), “Fargo” spent an entire episode filling us in on what they’ve been doing. And wouldn’t you figure, it was a lot. In another 90-minute entry (60 minutes without commercials), we watched as Peggy had the most self-assured nervous breakdown possible, Ed made a quick decision to sell Dodd for his family’s protection and Ohanzee hunted down his boss. By the end of it, though, Peggy seemed to be her happiest self, Ed’s deal was in the toilet and Ohanzee was on his own (or at least ready to go on the run). “Loplop” marked an eventful, streamlined hour-plus of television, marked with perfectly-placed moments of levity that helped break up some truly tense scenes. In likely the best episode since the first, director Keith Gordon and credited writer Bob Delaurentis started us on the beginning of the end. The massacre of Sioux Falls is right around the corner, and — if it’s as exciting as this — we’re in for quite the treat. If there is an afterlife, Dodd is spending his in a fit of rage, wondering how he let two small-town Minnesotans get the best of him in a game of life and death. Sure, it was Ohanzee who pulled the trigger, but the Blomquists had things pretty well in hand before he showed up. Even after Dodd escaped, showed Peggy the back of his hand and strung Ed up by the rafters, somehow he still ended up dead. Oh, he must be absolutely livid! Oddly enough, the person who has to be most thankful never to see Dodd again is his brother, Bear (Angus Sampson). Last week, he either killed or banished Dodd’s daughter, Simone (Rachel Keller). This was the main reason I was surprised to see Dodd die, as his expected conflict with Bear seemed all too juicy to pass up. Yet dead he is, marking a big loss for the Gerhardt family — maybe. Dodd was a good warrior, but he’s certainly to blame for the mess the family finds itself in currently. Perhaps without him, cooler heads will prevail. That, or the Gerhardts will try to kill absolutely everybody out of revenge. Yeah, okay. It’s probably the latter. That’s one thing this Life Spring retreat got right: Peggy really is finding herself. The only problem is she’s pulling a Walter White and learning that she likes to be bad. She felt “trapped” in their home, and now she’s ecstatic to be rid of it. She must’ve gotten a rush out of electrocuting Dodd because she took it a step further and started stabbing him. When Constance, her boss, asked if the trip was romantic, Peggy started to say no, thought about it, and then realized it kind of was (at least to her). It’s a transformative episode for Mrs. Blomquist, and Dunst handled every scene deftly; shifting from exuberant glee to anger in the blink of an eye, and all that was before she and Ed shared that knowing look over Ohanzee’s long-haired head. That scene alone should win her an Emmy, but it’s just a drop in the bucket of what she’s been able to do this season. Let’s talk a little bit about Ohanzee. His decision to turn on Dodd (if not the whole Gerhardt clan) was well-established. As soon as Dodd called him a “half-breed” upon entering the cabin, we knew the put-upon Native American wasn’t going to let that stand. What’s interesting, though, was what happened next. In one of the most (if not theeeee most) nerve-wracking scenes in series history, Ohanzee asked Peggy to give him a “professional” haircut. Now, practically speaking, he had to know he was being hunted, and changing his hair — read: making him look less Native American — would help him hide from the authorities. But there was something in the way in which he asked for the haircut that made me think Ohanzee was ready to die. Forced into service for a country that doesn’t even want him (and then made to act like a lab rat, exploring tunnels booby-trapped and fortified by the Vietcong), we got to know Ohanzee better in this episode than in any of the previous seven. He just wanted to be treated with the respect of his fellow soldiers and his fellow men, and his particular set of skills allowed him opportunity to take revenge on those who wronged him. That being said, he didn’t seem to derive much satisfaction from slaying the racist bartender and his patrons. Which again, leads me to think he was putting his fate in Peggy’s lethal hands. Combine what happened at the bar with the idea that Ohanzee could have had anyone cut his hair (or do it himself), rather than let a woman who’d kidnapped his boss, stabbed him repeatedly in the chest and then once more in the foot wield a pair of scissors right next to his neck. Ohanzee may have simply been sick of this world, ready to accept whatever fate these white devils were willing to give him — even after he “saved” them. The parallels to the war were well-placed, allowing viewers to discover Ohanzee’s circular world on their own, rather than be force fed another connection like in select episodes prior. 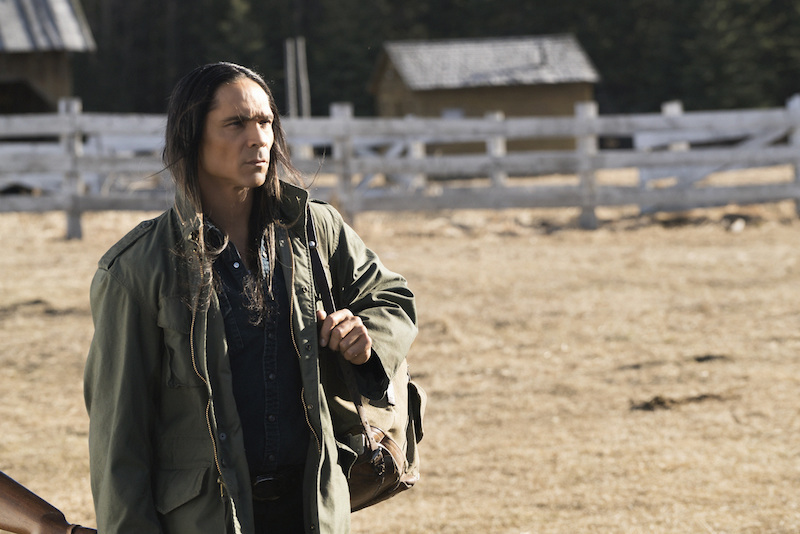 Ohanzee, of course, ended up escaping; fleeing the cabin wounded both emotionally and physically, with the authorities just a few steps behind (similar to the movie Peggy was watching, in which a hero figure saved the couple, but the bad guy survived to come after them once more). Would Peggy have finished the job if given enough time? Would Ohanzee have died without a fight? He tried shooting Ed on his way out, but never turned the gun on his wife (despite her literally stabbing him in the back). We’ve been waiting all year for Ohanzee to come into his own. Now that he has, I hope to see even more. 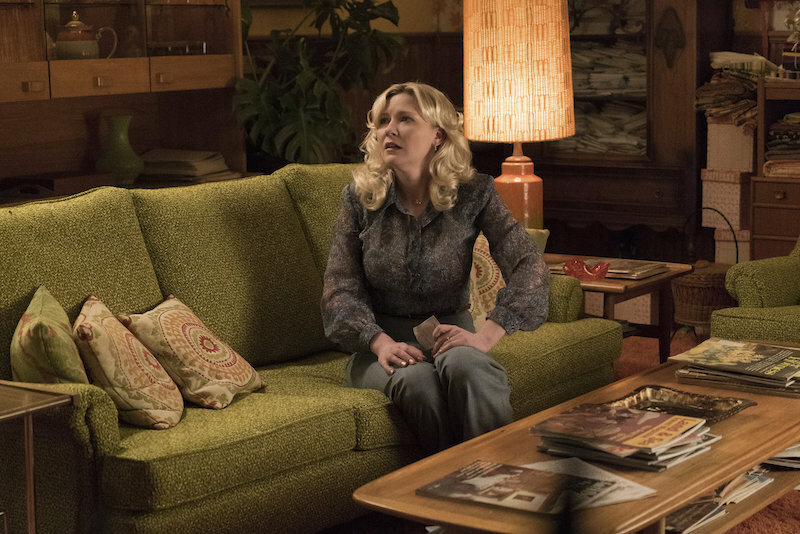 It may just be me, but two brief moments made “Loplop” one of the funniest episodes of “Fargo” to date. The first came when Ed went to make his first phone call to the Gerhardt residence. When they answered, his Midwestern manners kicked in and he very nearly said, “Hi, this is Ed Blomquist. How are ya today?” His stammering stops and starts had me in tatters, as did Dodd’s reaction to getting a pillowcase over his head. Donovan deserves props for bringing both menace and amusement to the character, the latter of which was evident even when we couldn’t see his face. Twisting his head around to no avail in an effort to shake loose his covering, Dodd’s simple “Goddamnit” was proper punctuation on a pretty funny scene overall. 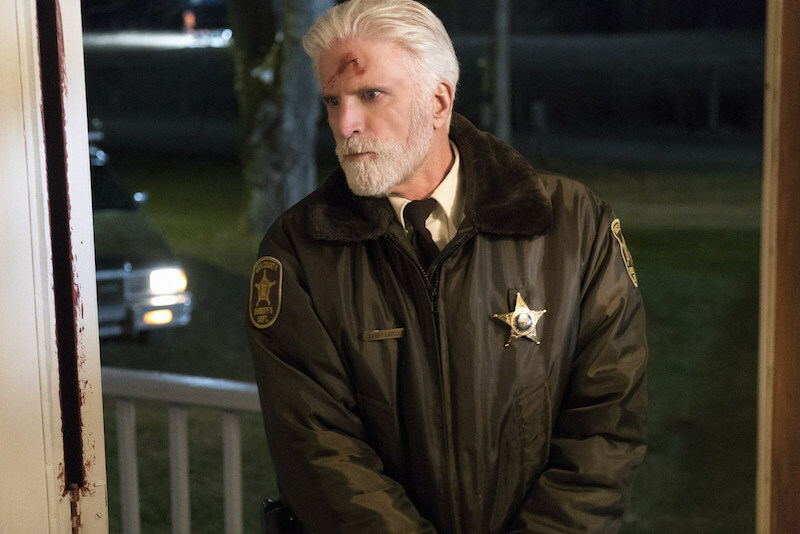 There was no question whether or not Hank (Ted Danson) would survive his rough knock to the head, but — as we’ve noted before — we remain worried he’ll survive the season. Yet we’ve made it this far and Hank’s a little worse for wear, but mostly fine. He obviously felt up to responding to the 911 call made by the local convenience store clerk, joining Lou (Patrick Wilson) on the hunt for Ohanzee. Something tells me Hank hasn’t seen the last of his assailant, however. I just hope he can survive the season. Yet with two episodes left, what’s truly scary is the lack of collateral damage. Lou, Hank, Betsey (Cristin Milioti), Karl (Nick Offerman) and even the Blomquists (who aren’t exactly innocent bystanders) have all survived this far. Surely someone has to be a part of the massive body count a’comin’. Who do you think it will be, and who do you dread dying the most?